The TOM’S Racing Spirit & TOM’S Racing New Sport FF are JDM Wheels specifically made for small fwd Toyotas of the 80’s. 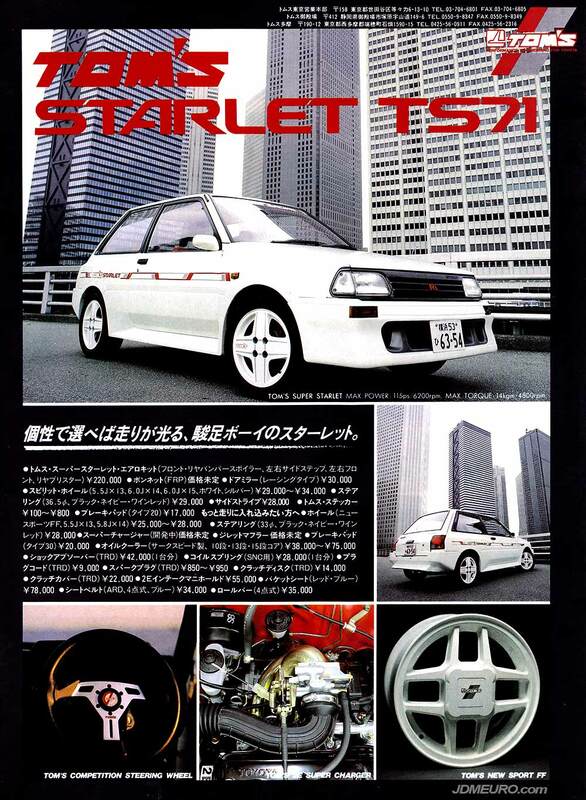 Pictured on the TOM’S Super Starlet TS71 are the TOM’S Racing Spirit, a 4 spoke JDM Wheel which features one piece construction and the TOM’S logo on the left spoke. Also included is the TOM’S New Sport FF, a lighter wheel 4 spoke wheel with split spoke design and covere lug nuts. The TOM’s Competition Steering Wheel is shown without the optional horn pad. 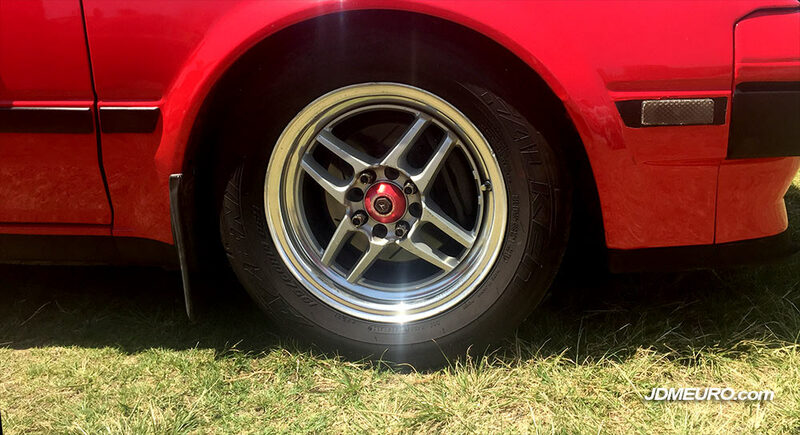 The Tom’s Racing New Action are lightweight JDM Wheels made specifically for older Toyota cars from the 80’s and the 90’s. The Tom’s Racing feature 2 piece welded design with a distinct dual spoke cross design. 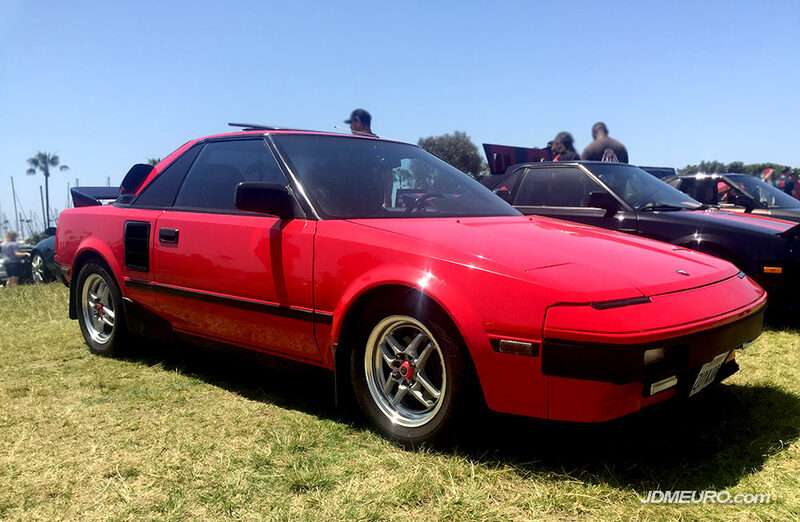 Pictured here are the Tom’s New Action in 15″ diameter on a AW11 Toyota MR2 at the at the Toyotafest 2018 in Long Beach, CA. This set of Toms Racing Igetta old school JDM Wheels was spotted on this Toyota Starlet 1300 Rally Car at the 2018 Tokyo Auto Salon. 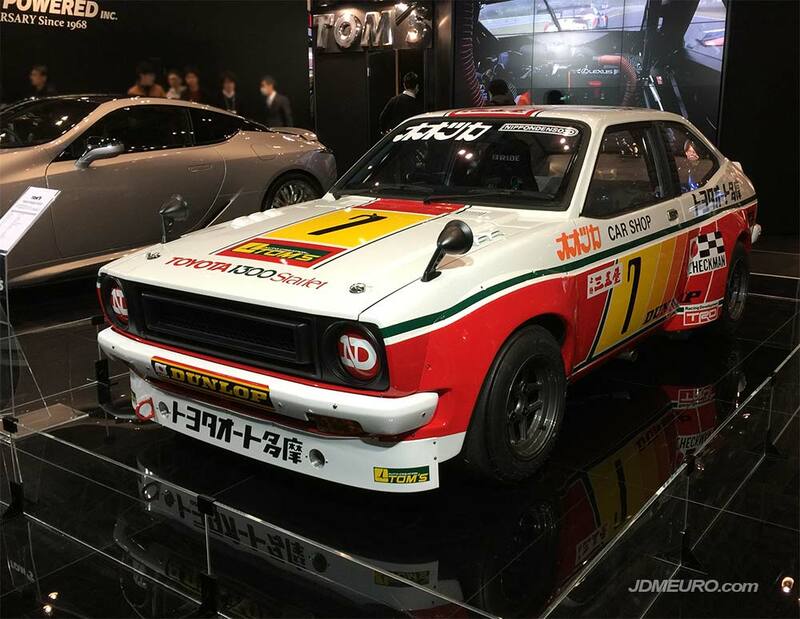 This Toyota Starlet 1300 was diplayed in the TOMS Racing booth next to a new school Lexus LC500. The livery was on point with the old school displays such as Checkman Racing, Japanese Dunlop and even the green TOMS Racing logos. 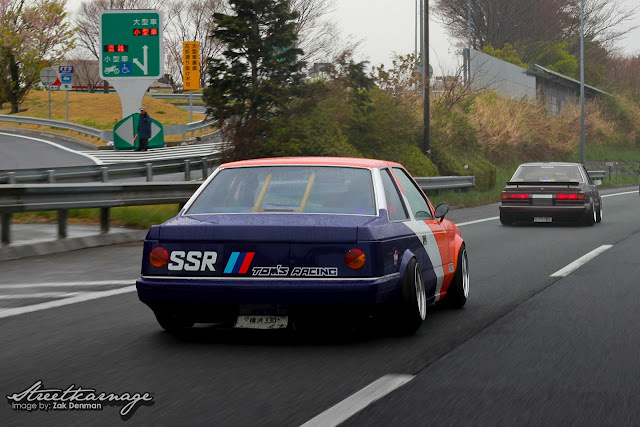 The SSR Casablanca 8 are JDM Wheels by Japanese wheel manufacturer SSR Wheels. 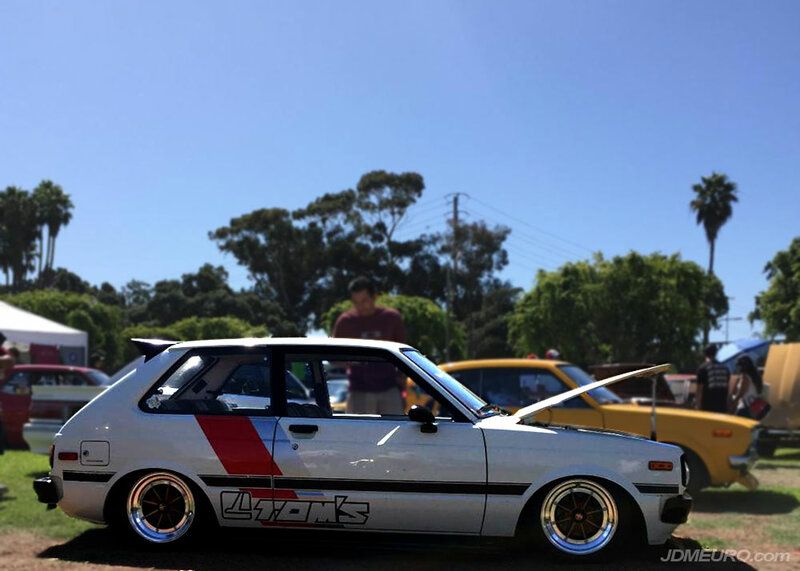 This beautiful set of SSR Casablanca 8, sit nicely on an aired out Toyota Starlet KP61. More interestingly, this KP61 Starlet made its way to Long Beach, CA all the way from Hawaii to attend the 2017 Japanese Classic Car Show (JCCS 2017)! Dressed in TOM’S RACING livery this Toyota Starlet was definitely a crowd pleaser. 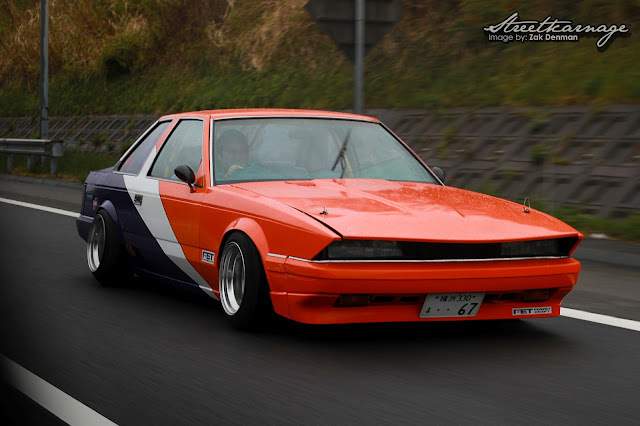 Tom’s Racing is a JDM Tuning Firm for Toyota Automobiles in Japan. 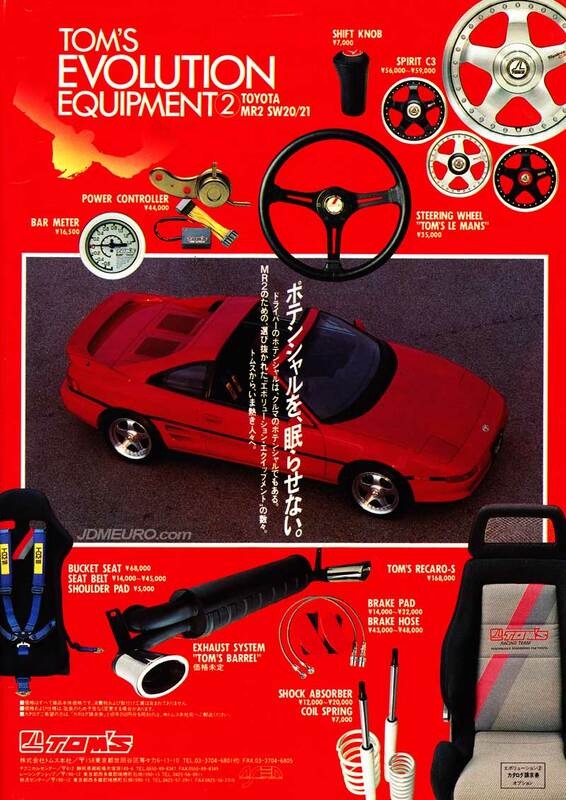 The attached advertisement contains parts for the SW20 Toyota MR2. Most Notable are the Tom’s Racing Spirit C3 JDM Wheels actually made by Rays Engineering. Another nice partis the Tom’s Le Mans Steering Wheels made by Personal / Nardi.The Tom’s Recaro S and Tom’s Bucket Seats by Recaro are also nice pieces. Kind of looks like everything here are made by other tuning firms. Here’s the other side of that car… To be honest I don’t even know what car it is, please fill me in!